I wonder if the day will come when wrestling impresario Vince McMahon of the WWE is noted as one of popular culture's true game-changers, worthy of mentioning in the company of Walt Disney, George Lucas, Stan Lee, Charles Cassady Jr. (just seeing if you were paying attention), etc. Sure, the guy fumbled badly with the "XFL" football league, but he took TV's pro wrestling from a louche carnie-sideshow thing to a multi-billion-dollar industry of character-driven sports-u-tainment, diversified into arena events, toys, games, books, magazines, restaurants and, of course, movies and DVDs - the latter not just compilations of bouts and documentaries about the actor-athletes but also big-screen scripted actioners such as that Steve Austin vehicle THE CONDEMNED. Well, okay, fine. It's no surprise that big-time pro-wrestlers crossed the velvet ropes to act in extreme-cop slams and shoot-em-ups (like Austin's 2011 direct-to-DVD entry TACTICAL FORCE, which wasn't as bad as I expected, even had an unidentified-glowing-thing-in-a-briefcase a la PULP FICTION). Football players have done it for ages, and the penny should have dropped long before Andre the Giant guested successfully in THE PRINCESS BRIDE ("I am the Dread Pirate Roberts!"). But I was still surprised when the WWE logo came up a few months ago on a very different flick that went direct-to-DVD in most of the country, the coming-of-age dramedy THAT'S WHAT I AM. It's not a cinematic marvel by any means. 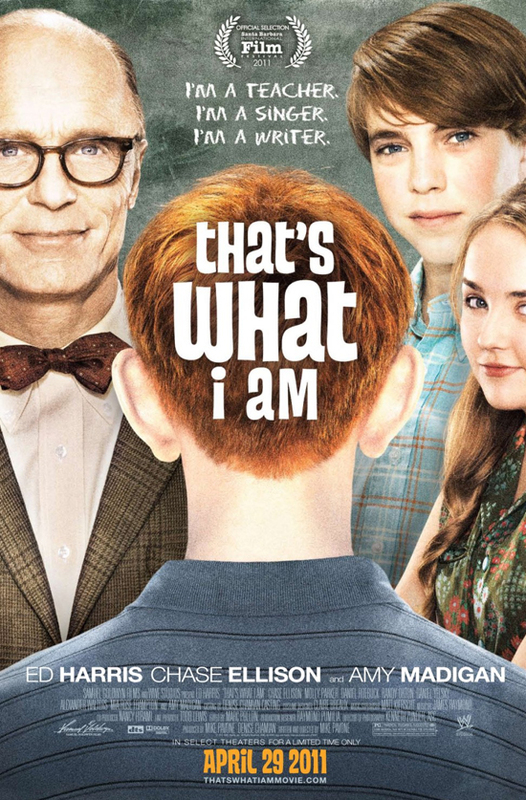 Writer-director Mike Pavone's PG-rated flick is kind of a tossed salad of adolescent school-age angst and uplift, sort of a DIARY OF A WIMPY MY BODYGUARD NAPOLEON-DYNAMITES MR. HOLLAND'S OPUS STANDING BY ME etc. Overly precocious narration somewhat reminiscent of Jean Shepherd's voiceovers in the sacred A CHRISTMAS STORY introduce us to the world of 12-year-old Andy Nichol (Chase Ellison), an aspiring writer in a typical American junior high circa 1965 who is misunderstood by his bossy computer-technician dad. 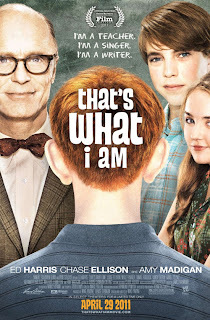 Andy's favorite teacher, the widowed Mr. Simon (Ed Harris), is tired of seeing the playground bullies being nasty to tall, stoic school misfit Stanley (Alex Hardee), and he deliberately buddies Andy up with Stanley in an English assignment. Reluctant Andy thus gets caught in all kinds of predictable learning-to-stand-up-to-the-bully drama, while also developing a first crush with a homeroom heartbreaker. On the side, however, longstanding locker-room whispers leak out to parents that Mr. Simon is a "homo." The incipient controversy jeopardizes the kindly instructor's job - especially when Mr. Simon refuses to deny the gossip that he's gay. Though it purports to be based on actual events, dialogue between the kids especially is more often on the sitcomy side than not, scattered with anachronistic slang here as well as some pretty heavy-handed nobility. Still, the grownup material was better (and pretty live-wire now, in light of the Penn State scandal). But I kept watching because I wanted to know what all this has got to do with pro wrestling. Does Stanley grow up to be the Undertaker, The Rock or Hulk Hogan? Does Mr. Simon prove his machismo by body-slamming Soviets or Viet Cong in a steel-cage match and publicly smooching the principal (played by Amy Madigan, the real-life wife of Ed Harris)? No, the picture just concludes like the nice, well-intentioned middling PG coming-of-age anti-bully flick that it is. The WWE connection: wrestling superstar Randy Orton has a supporting bit as a glowering homophobe of a parent, doing some scenes opposite thespians Harris and Madigan. And that's all, kind of like his calling-card into serious acting. The DVD carried a coming-attraction, in fact, of another WWE movie by Mike Pavone, INSIDE OUT, which looks like a rougher-edged drama of an ex-con trying to go straight despite lingering bad influences. It tag-teams Triple H with Parker Posey and Michael Rappaport. And you know what? I approve this message. Vince McMahon got me - and I suppose many wrestling fans, especially in the kid demographic - paying more attention to THAT'S WHAT I AM than anyone would have otherwise, and that's just fine. I'm tired of oversized super-heroics and beat-downs, and I like the idea of these gentlemen and ladies of the ring (many of whom are playing characters pretty much anyway in their wrestling personas) being cast in against-type material, not just the same old action slams. I hope the WWE gets behind additional modest, human-scale projects like THAT'S WHAT I AM. And if the scripts aren't "The Seagull" or "Waiting for Godot," you can't have everything.